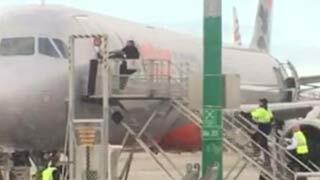 Irate about missing his flight, a passenger stormed his way onto the tarmac at MEL, ran up the flight stairs and tried to wrench open the door of a Jetstar plane before takeoff. It gets worse – the plane wasn’t even flying to where he wanted to go. As well as an acute demonstration of stupidity, the incident represents an alarming breach of security – if someone can reach a plane that way, who knows what they might do? The man was apprehended and arrested. Footage of the incident on Channel 9 News shows the man reaching the plane’s door, placing his foot against the plane’s fuselage as a brace to achieve maximum leverage, and actually managing to open the door, just a little, a couple of times before airport workers catch and detain him. The punchline is this: it wasn’t even the right plane. The man was heading to Adelaide. The Jetstar flight he tried desperately to board was going to Sydney. Channel 9 reported the man had become “irate and physical” with Jetstar staff after being told he was hours late for his earlier flight to Adelaide. He was reportedly then seen smoking inside the terminal, before running to a gate, shoving crew aside and sprinting onto the tarmac. He didn’t run up the flight stairs, however – the video shows him walking to the door, before trying determinedly to wrench it open. Baggage handlers restrained him and he was handed over to Australian Federal Police (AFP). Jetstar was reported to have condemned the behaviour as “unacceptable” and placed an immediate ban on the passenger. The flight was delayed an hour while engineers carried out a check. The AFP were reported later to have charged the man with one count of unlawful assault of an airline employee. Other charges could follow as investigations continue.